With predictions of 6-10 inches of snow arriving tonight and tomorrow, my thoughts turn to winter traditions, especially those associated with snow. One of those in our family has been making ice cream for New Year's Eve or Day. We haul out the freezer, stir up a custard, then make vanilla ice cream we can use with various accompaniments-chocolate sauce, crushed strawberries, raspberries, caramel sauce, or simply plain. Also, to youngsters of yesteryear, and of my daughter's childhood, too, blizzard time meant snow ice cream. This treat, concocted from snow, sugar, milk, and flavorings was one of the highlights of winter in the days when store-bought ice cream didn't exist or was a rare treat. Snow ice cream, handed down from Yankee ancestors, is a delightful snack at snow time, which appeals to children and adults. It's best when made from freshly fallen snow, fine and hard, not wet and soggy, that's scooped from a big drift where there's no likelihood of scraping soil. Spoon the snow into a large bowl. Over this pour a custard previously made by mixing together a quart of milk, an egg, 1 cup sugar, 1/4 teaspoon salt, and 1 teaspoon pure vanilla extract, cooking until thickened, then cooling to room temperature. 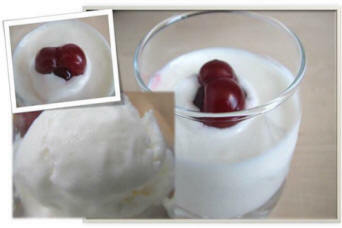 Snow and custard are put alternately into the bowl until no more snow can be stirred into the mixture. 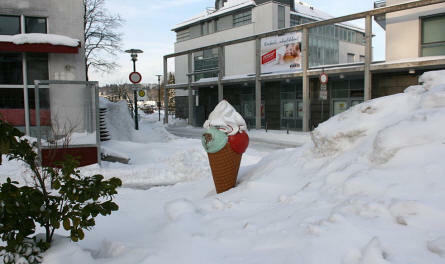 The ice cream chills to a delicious thickness, but has to be eaten quickly before it melts. This is quicker but doesn't produce such creamy results. Mix together in a large bowl, a cup of top milk or cream, 1/2 cup sugar, 1 teaspoon vanilla. Into this stir snow, as much as can be flavored by the liquid. This also has to be eaten very quickly for it melts even more rapidly than the custard type. As soon as the first snowflakes drifted down, my siblings and I hoped there would be enough so we could make this treat. Recorded history relates that Emperor Nero of ancient Rome was the first to indulge in a delicacy even vaguely resembling ice cream. He had swift runners bring snow from the mountains, which when mixed with fruit juices was not unlike modern ices. Another mention of frozen desserts is made in 13th century annals that Marco Polo brought home to Italy from Cathay a recipe calling for milk in addition to snow and juices. From there these frozen treats spread throughout Europe and were served mainly at the tables of the royal and very rich. These chilled desserts appeared in the American colonies in the late 1600s. By the end of the 1700s ice cream parlors were beginning to crop up in New York. Custard for Vanilla Ice Cream - Mix together 1 tablespoon flour, 1 cup sugar, 1/8 teaspoon salt; add 1 slightly beaten egg and 2 cups milk gradually. Cook over hot water approximately 10 minutes, stirring constantly, until thickened. Should the custard have a slightly curdled appearance, this will disappear with freezing. When cooled, add 2 cups half and half cream (some people prefer heavy cream) and 1 to 2 teaspoons pure vanilla extract. Freeze as directed for your ice cream freezer. Makes about 1 1/2 quarts. (We always double the recipe.) This is delicious when topped with strawberries or hot fudge sauce. (Mary Emma Allen writes from her woodland home in New Hampshire. She researches family food history and teaches classes in compiling family cookbooks.